In six intensive courses across the season, the talented young musicians in Britten Sinfonia Academy (BSA) explore different aspects of repertoire, performance and musical leadership for which Britten Sinfonia is renowned. Inspired by the Fitzwilliam Museum’s superb collection, this course will split the orchestra into smaller chamber ensembles and challenge them to programme a 15 minute pop-up concert, using the museum’s online collection as a starting point. Each group will be paired with an Academy composer and will decide on a theme to base their programme around. 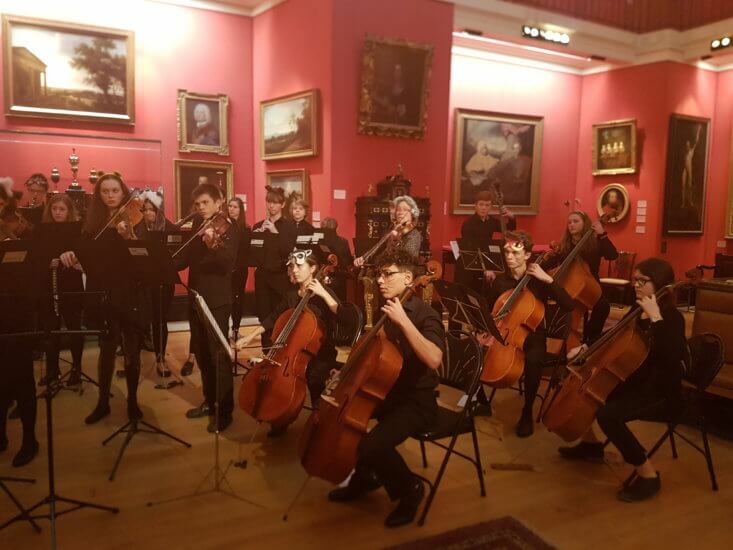 Mentored by members of Britten Sinfonia, they will develop their programming and presentation skills and perform an exciting series of pop-up chamber performances across the museum’s key collections on 21 January. The BSA composer hub aims to support talented young composers aged 11-18 from the East of England. We aim to develop their creative, technical and stylistic skills through a programme of tailored compositional briefs, mentoring, rehearsals and public performance opportunities. This year the hub is led by professional composer Tom Coult, who will mentor the four students across the year and attend one day of each of the six orchestral courses. Tom will also write a new commission for the Academy which will be premiered during our At Lunch Four concerts in Norwich and Cambridge in July 2018. We are accepting applications to Britten Sinfonia Academy 2018-19 until Monday 5 February 2018. Find out more here.